Now the subject of a major film. There are golfers, and there are golfers. And then there's Seve. Severiano Ballesteros was perhaps the most naturally gifted golfer ever to have walked a fairway. From the moment his brother Manuel gave him his first club he was unstoppable. A few weeks before his seventeenth birthday he turned pro. Five years later he won the Open. A genius had arrived. For the best part of two decades Seve dominated the golfing landscape. He played shots others could only dream of. With 94 wins as a professional (including 5 majors) he was a phenomenon, an athlete who transcended his sport. But Seve stood for more than simple excellence. Almost single-handedly, Seve gave European golf credibility; almost single-handedly, he made the Ryder Cup one of the greatest contests in world sport. And when, as captain, he finally lifted the trophy on home soil in 1997, a whole continent rejoiced. His pride and passion have inspired millions, and we have taken him to our hearts. 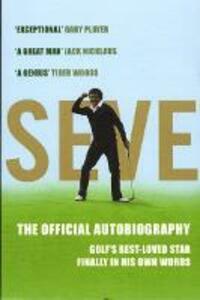 Here, for the first time, Seve tells his own story. From his humble beginnings right up to the present day, here at last is the man behind the magic in his own words. Seve is utterly entertaining, blazingly charismatic and unique. Severiano "Seve" Ballesteros Sota was a Spanish professional golfer and a leading sports figure. He won more than 90 international tournaments in an illustrious career. He first caught the attention of the sporting world in 1976, when at the age of 19 he finished second at The Open. He played a leading role in the re-emergence of European golf, helping the European Ryder Cup team to five wins both as a player and captain. He won the World Match Play Championship a record-tying five times. He is generally regarded as the greatest Continental European golfer of all time and won a record 50 times on the European Tour.